An Outdoor kitchen or custom BBQ will easily become the focal point of any backyard patio. There is no better way to serve up great food and fun than with your own custom built BBQ. 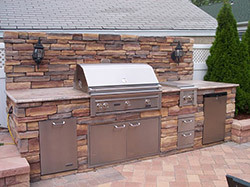 If your looking for the Ultimate grilling experience, a custom built Outdoor kitchen is the way to go.